Meet the Duchess of Plaisance! There is a sense of mystery and glamour clinging to the figure of the Duchess of Plaisance. I, like most people, was captivated by her story from the moment I first heard of her but really, I knew almost nothing about her. 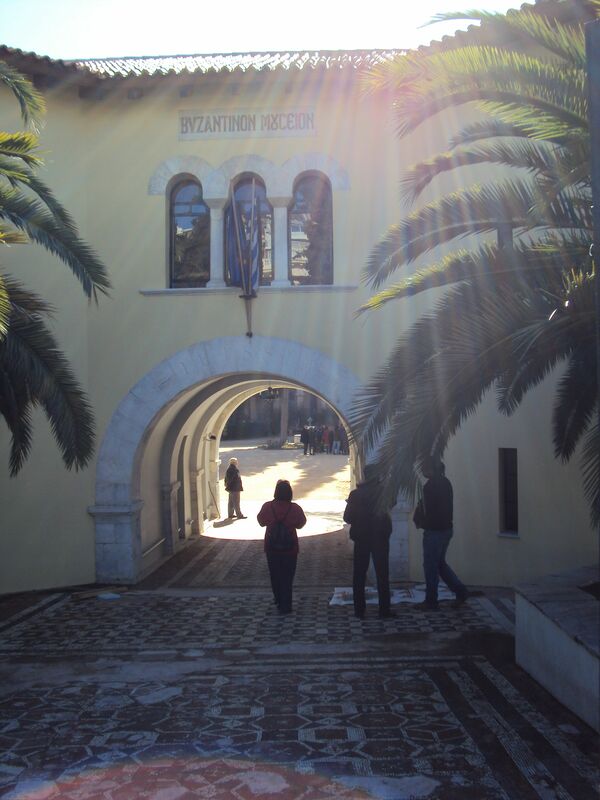 Most Athenians are familiar with her name – there is even a metro station named after- but usually they have heard only the myths and legends surrounding the duchess, not the historical facts. Gateway to the Byzantine and Christian Museum. A few years ago, an exhibition in the Byzantine and Christian Museum really brought the hitherto shadowy figure of the duchess into a clearer perspective for me. Surprisingly, it seems that the duchess was born not in a relatively unknown European principality, but in America! Sophie de Marbois entered this world in Philadelphia, Pennsylvania, where her father, Francois Barbé Marbois, was serving as the French Consul General in 1785. At around the age of seventeen she married Charles Lebrun, who subsequently inherited the title of Duc de Plaisance, or Piacenza as it is known in Italy. In October 1804 Sophie gave birth to their only child, a daughter, Eliza LeBrun de Plaisance. The Lebrun’s marriage was an unhappy one, and by around 1820 it had reached crisis point, with matters degenerating to such a degree that Sophie claimed her husband wanted to kill her. They separated, and soon after the couple were living separate lives; Sophie in Italy, and Charles in Holland. Possibly, the duchess’s personal unhappiness found an outlet in her championing of the cause of Greek independence. 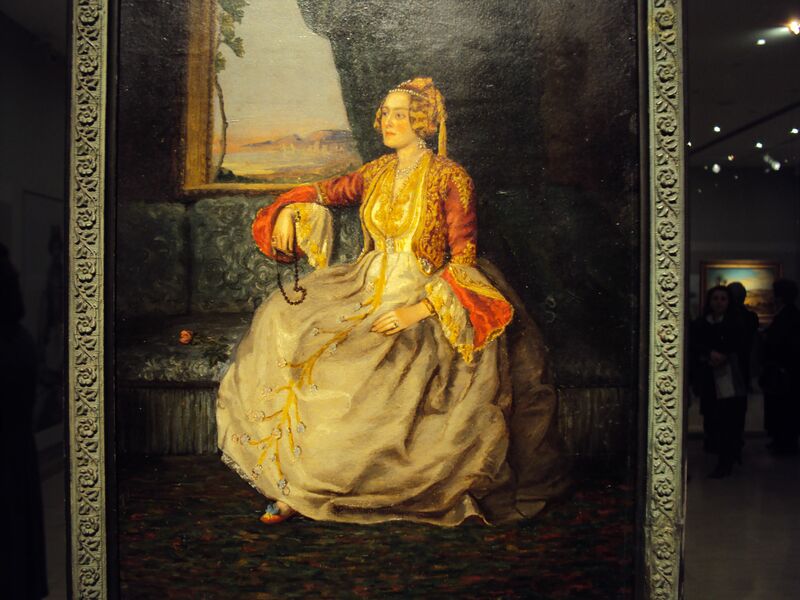 After meeting the man who would become the first head of state of a newly liberated Greece, Count Ioannis Capodistrias in Paris in 1826, the duchess became a generous benefactor to the Greek liberation effort. Within a few years of the outbreak of the Greek War of Independence, both the duchesse and her daughter Eliza found themselves at the forefront of the wave of Philhellenism which swept across Western Europe. Sophie and Eliza gave large sums of money to the Greek effort, one source records that Eliza raised a significant amount alone by selling her jewellery. In January 1830 the Genike Ephimerida tes Ellados announced that the Duchess of Plaisance and her daughter had arrived in Nafplio, the capital of Greece at this time. Their old acquaintance Ioannes Capodistrias had been president of Greece for just over two years, but, for whatever reason, the relationship between Capodistrias and the duchess soured rapidly and she soon became outspokenly opposed to his political views and left for Italy. 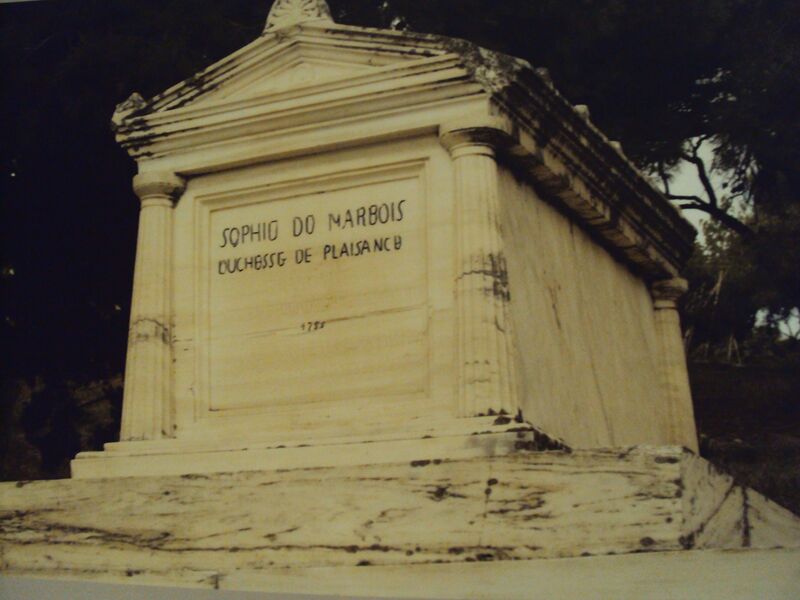 The Duchess’ grave in Athens First Cemetery. The duchess returned to Greece in 1834 and settled in the new capital of Athens. Greece now had a Bavarian King, Otto, but the duchess chose not to mix freely in court circles and instead rented a mansion on Pireos street. Always an avid traveller, the duchess set off on a voyage to the Middle East and Beirut, where, sadly, her daughter Eliza died. Grief following the death of Eliza. 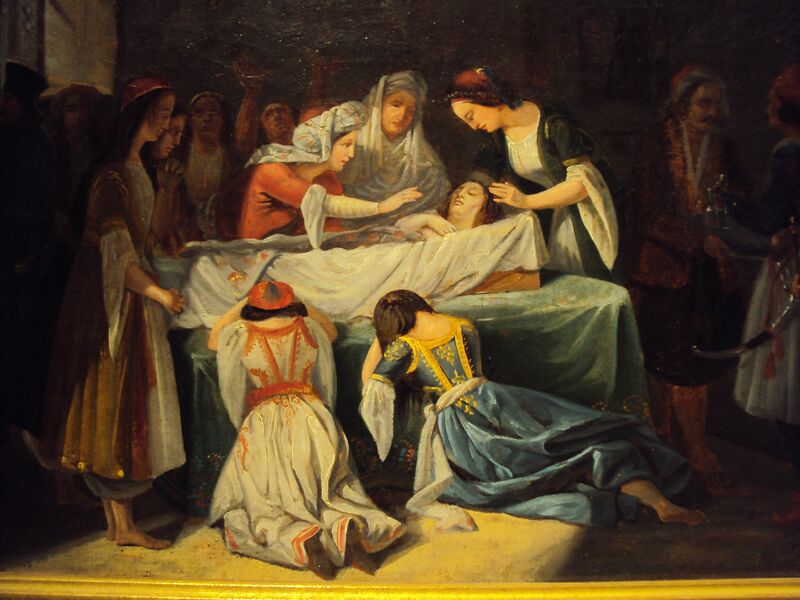 Completely devastated by her daughters death, the duchess returned to Athens with her embalmed remains, and true to the promise made to her dying daughter never to leave her side, she kept Eliza’s coffin with her in each house where she took up residence. This eccentric behaviour didn’t sit well with Athenians, who whispered that she would hold long and animated conversations with her daughters remains. The duchess then purchased huge tracts of land from the abbott of the monastery of Pendeli, and engaged the architect Stamatios Kleanthis to design a little palace for her on the slopes of Mount Pendeli. It is so sad that today the duchess’s Pendeli palace looks forgotten and shuttered, and it’s not an easy task to find it as the signposting is dismal and confusing. 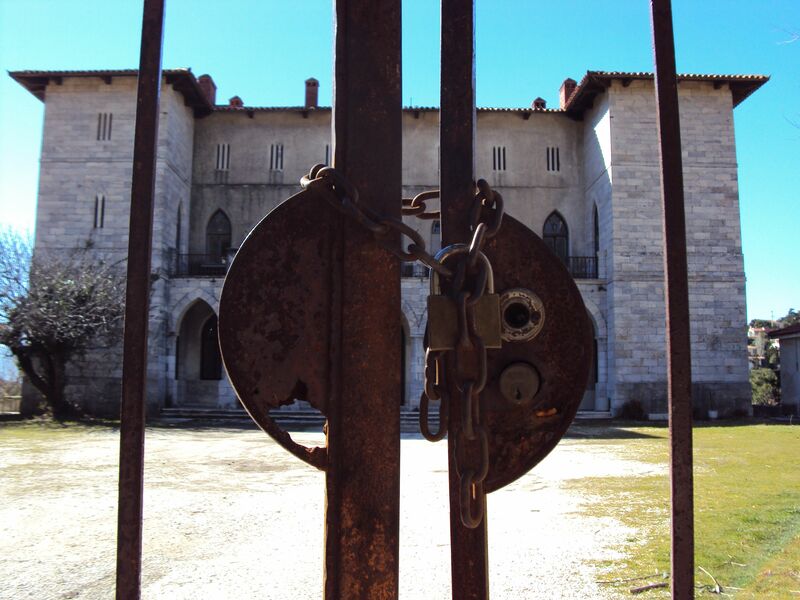 Luckily, the Villa Ilissia, built in 1848, is not suffering the same fate. Also designed by Kleanthis, it now houses the Byzantine and Christian museum and you can see the similarity in architectural styles between the two palaces. This town house looked straight onto Mount Lycabettous, then a barren wilderness on the outskirts of town, and the back of the villa overlooked the river Ilissos. The duchess became a central figure in the social life of Otthonian Athens. Her generosity was legendary, and her love of learning meant she sponsored many young Greek women, enabling them to get an education. She loved to host symposia on topics such as religion and politics. But the duchess was just a bit too unconventional for Athenian society at that time. Her probable conversion to Judaism and sponsoring of the building of a synagogue in Evia would not have been a popular move in Orthodox Athens. Later in life Sophie commissioned Kleanthis to build a final home and resting place for her daughters remains, the Castle of Rodanthi. Sadly, she would never live to see this building completed as it caught fire and burned to the ground. After that, the duchess withdrew from public life until her death in 1854 at the age of 69. I think she probably encouraged the legends and rumours that grew up around her. Obviously, she was a bit of an oddball and slightly eccentric. She definitely did have her daughter embalmed and placed in the basement of her house, she granted titles of nobility to those she liked, she dabbled in mysticism and had contact with many of the bandits that roamed the hills surrounding Athens, but I think all these traits just add to her appeal as one of the liveliest and most fascinating figures in early modern Greek history. Previous Skorpios has a sting in its tale! What a beautiful blog you do Corinne. I had no idea. Embarrasses the hell out of me and my bit of silliness.